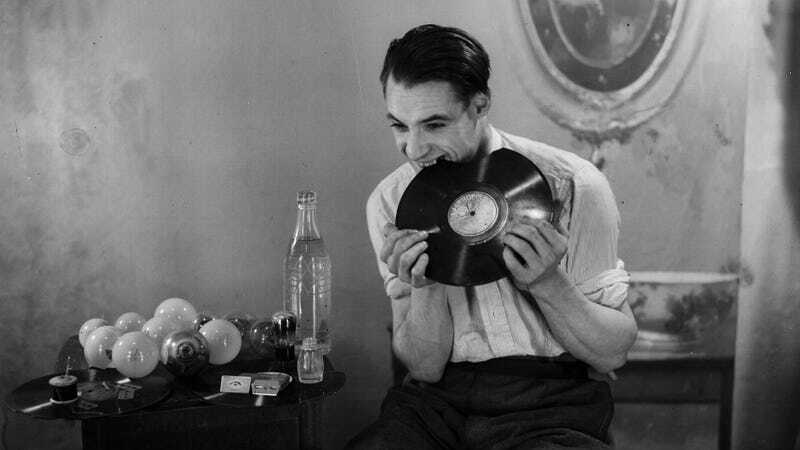 1938: A man chews up a gramophone record. Beside him is a table on which are light bulbs waiting to be eaten. Strangest fact: Tarrare was decidedly not a picky eater. While performing, he would eat corks, stones, and live animals. When his act led to an intestinal blockage, he thanked the doctor who treated him by offering to eat his watch. The doctor said he’d cut Tarrare open to get it back if necessary. When not performing, he was known to eat garbage and pick food scraps from dung heaps, and once while hospitalized, he allegedly drank the blood of patients undergoing bloodletting and was caught attempting to eat bodies in the morgue. He also apparently ate a cat—minus the bones (he vomited up the fur after)—and swallowed an eel whole, and was once suspected of eating a toddler. Thing we were happiest to learn: Tarrare was able to use his appetite to serve his country. In the 1790s, he enlisted in the War Of The First Coalition, in which France took on the Holy Roman Empire, Austria, Britain, Spain, Portugal, and the Dutch Republic simultaneously, and won. But military rations weren’t nearly enough to sustain him—Tarrere would become extremely exhausted if he didn’t have his customary intake of food—and he would scavenge for food or barter with other soldiers. The French Revolutionary Army defeats the Austro-Dutch forces at the Battle of Fleurus during the War Of The First Coalition on June 26, 1794. His commanders quickly caught on to his condition, and realized they could exploit it for military purposes. After eating 30 pounds of raw liver and cow’s lungs as a demonstration for the top brass, he was assigned a role as a spy—a message was placed into a small wooden box, which Tarrare would eat. He would, for lack of a better word, poop out the box, message intact. However, his first mission went awry when he was sent behind German lines despite not speaking a word of German. He was quickly found out and captured, and under duress admitted the ruse. Upon retrieving the box, the Prussian commander was enraged to find it was only a dummy message the French were using to test the system. He ordered Tarrare hanged, but relented at the last minute, and he was released near French lines after a severe beating. The garden front of the Palace Of Versailles circa 1750. Engraving by Langlois after Perelle. Best link to elsewhere on Wikipedia: After his stint in the army, Tarrare checked into a hospital, ready to submit to any possible cure rather than repeat his behind-enemy-lines fiasco. Treatments included wine vinegar, tobacco pills, and eating large quantities of soft-boiled eggs, but nothing worked. His doctor also tried laudanum. The 19th century’s favorite extra-extra-extra-strength cough medicine, the tonic is a tincture of opium that includes nearly all of the plant’s various alkaloids, including morphine and codeine, mixed together with alcohol for good measure. As such, it’s dangerously addictive. And in case anyone thinks our current opioid epidemic is a new phenomenon, it was wildly popular in the 1700s and 1800s, used to treat everything from menstrual cramps to insomnia to colicky babies.